There are two articles up at WUWT today that falsely claim "it's cooling", when in fact the Earth continues to heat up. One by Denier Don Easterbrook and one by David Deming. 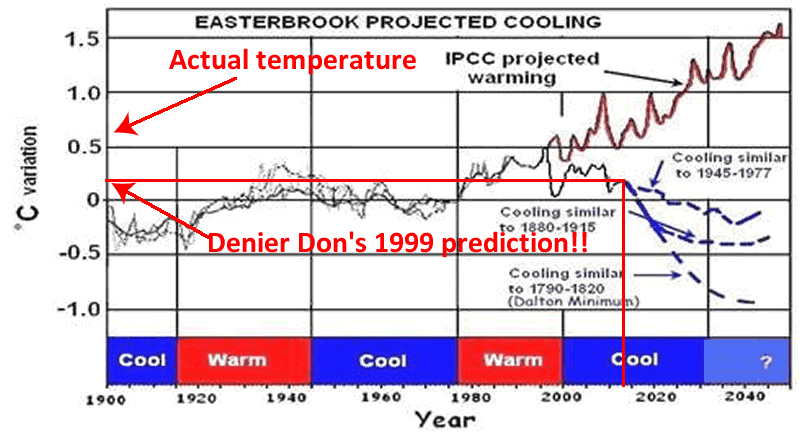 Denier Don put up a few of his wonky charts (archived here), including this one that has appeared on HotWhopper before. Click to enlarge. I don't know why he resurrected this old chart of his. It clearly shows that all his predictions have been a dismal failure. Observed temperatures are not that far from his "IPCC projected warming". And I don't know where he got his "IPCC projected warming" from either. Since he said he did the chart in 1999 or 2000, it should be from the Second Assessment Report (SAR). But I saw nothing like that chart in SAR. Anyway, look at Don's projections. According to him global surface temperatures should have taken a big dive fourteen years ago. Instead, look at what has happened. 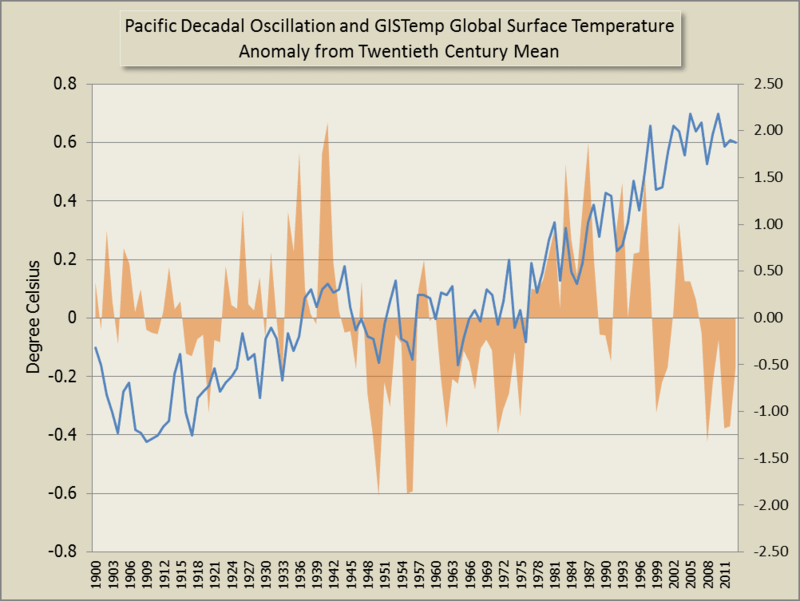 Like Don, I've compared global surface temperatures to the Pacific Decadal Oscillation from Nate Mantua's website. Don reckons temperatures should be back at those of around 1980 now and heading for colder. So the question now becomes how could my predictions be validated? Certainly not by any computer climate models, which had proven to be essentially worthless. The obvious answer is to check my predictions against what the climate does over several decades. We’ve been within my predicted cooling cycle for more than a decade, so what has happened? We’ve now experienced 17 years with no global warming (in fact, slight cooling) despite the IPCC prediction that we should now be ~1° F warmer (Figs. 6, 7, 8). So far my 1999 prediction seems to be on track and should last for another 20-25 years. On track? Just who does Don think he's kidding? In 1999 he predicted that by 2014, global surface temperature would be back to around that in 1980. Instead they are about 0.5 degrees warmer than 1980! So Don, your predictions have already proven to be worthless. Dismal David Deming is a big fat liar! Look again at the chart above. Where is his supposed cooling? Nowhere to be seen. Sure, the USA has been a bit cool the last few weeks. But no cooler than it was twenty years ago, going back only to the early 1990s. And in 2012 it had the hottest year ever on record. Other places are warming up too, obviously - looking at the surface temperature chart above. Here we I live we've been sweltering through another extreme heat wave with temperatures in the low 40s for almost a full week. And we've just had the hottest year on record plus broken a heap of other similar records all over the place. And it can't be blamed on ENSO - it's been neutral. There are no long-term global surface temperature reconstructions where the dip during the 1998-10 La Niña came close to reaching the values in the 1940s. Did you splice TLT data onto HADCRUT data? That’s what it looks like. Whatever it is, it’s bogus! • The IPCC was established in 1988. • The PDO was discovered in 1996. • The Vostok ice cores (1998?) showed co2 rise followed temperature rise. Would we have had this huge global warming scare if the IPCC had been established several years after the discovery of the PDO and the Vostok results? Are they really now so confident that co2 was responsible for most of the warming since mid 1970s? They may have doubts but will never openly come out and say it as it would ruin the game plan. One of the sad things is, we will never get an apology from any of these people. They will move on to the next scare, the next ‘theory,’ and find some way to blame skeptics for the failure of AGW. Reality is ‘liberal’ in their minds, after all. It will always be about them being right and us being wrong. Oh, and we should be silenced. And demonized. And ridiculed. And…. Well, he's right about them being ridiculed, that's for sure! Every 11,500 years this world we live on has an Ice Age. It has been nearly 12,000 years since the last Ice Age. All the talk is about a mini ice age coming. The lack of comment on a full blown Ice Age is very conspicuous in its absence. The latest Polar Vortex dropped temps in exactly the same areas that had a couple of km’s of ice over it 12,000 years ago. Actually it has been quite warm in the US ever since the two or three days of cold from the Arctic outbreak dissipated. Here in SW Montana we went (in my town at least) more than a week w/o the temperature dipping below freezing at any point. This is very warm for this time of year. In the NE my friends are remarking about how warm it has been, and of course on the California coast it is more like summer, with temperatures in the 70's and up and wildfires in the middle of the rainy season. Tony even had a preemptive post yesterday about the drought, just to make sure that nobody would get the idea that it is a serious matter. Unfortunately for him, the governor of the state declared a drought emergency and many counties have imposed mandatory water rationing. Yes, It’s been quite warm in the U.S. the past week where there was 454 warm records compared to 4 cold records, a ratio of 113 to 1. And to think that Tony put up a post crowing about a 6 to 1 ratio of cold records compared to warm records during the previous week of cold Arctic air in the U.S. The funny thing is that in my part of the country we haven't had any warm records. Just day after day after day of warm. Same thing on the central coast of CA or the coast of LA. Even during the "polar vortex" where I live we had one day of cool weather -- about 5F below normal -- and then back to the warm that had prevailed since the second week of December. Week of afternoon T-shirt weather in North Texas. In Melbourne the daily maximum temperature was above 20°C for 123 consecutive days - from December 8 until April 10, exceeding the previous record of 78 consecutive days above 20°C by a large margin, Similar new records were set in Tasmania at Hobart (105 days above 17°C) and Launceston Airport (104 days above 18°C). Deming: do see the Deming part of this coment. Denier Don mentions glacier change on Mt Baker but fails to mention that glacial loss has continued despite the change in PDO. It makes no sense how he has discovered a pattern in glacial retreat and advancement coinciding with a change in PDO but refuses to acknowledge how this pattern has broken down in recent years. I didn't see one "skeptic" question Denier Don. Really crazy when Bob Tisdale is the voice of reason. I don't know what role Easterbrook had in the PRP fiasco, but it looks like Watts is throwing him under the bus. Does this now mean that folks like Easterbrook, Archibald and Humlum no longer get to write guest nonsense on WUWT? Or is nepotism fine there?